For quite some time, NAR’s reports have shown that homeowners tend to stay in their homes for 5-7 years. Based on the data from NAR’s most recent Profile of Home Buyers and Sellers report, that was true up until 2008. By 2011–just after the seismic shifts that rocked the market–owner tenure rose to 9 years and has been range-bound between 8-10 years since 2010. 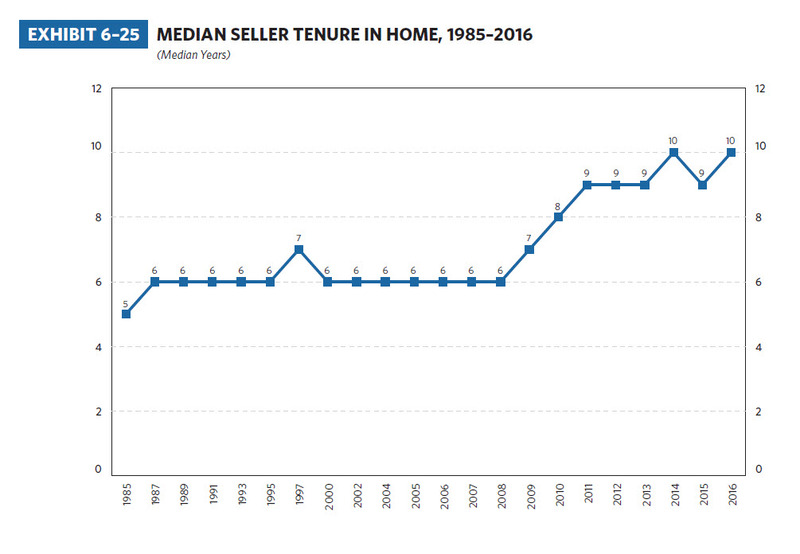 The current 2016 median tenure stands at 10 years. In summary, owning a home used to be a 5-7 year proposition, but owners now tend to be staying in their homes between 8-10 years. The fact that sellers are staying in their homes longer since the downturn is partly responsible for our low inventory levels. That said, this is still a median, meaning that half of homeowners spend less than 10 years in their home. At first, a relatively large share of homeowners were underwater and thus couldn’t sell (not the case anymore). But then rising prices, historically low rates and an improving economy caused buyer demand to surge far more quickly than listing activity. That has created a situation where sellers are confident about getting strong offers on their homes quickly, but they’re hesitant about being a buyer in this competitive and under-supplied marketplace. Many are making the decision to stay and possibly remodel their current space rather than competing and possibly making full price offers or better on the most desirable homes. Don’t expect quick resolution on the inventory shortage. New construction activity isn’t helping to alleviate the shortage because it’s not profitable to build at the entry-level or first-time buyer price point. We’re optimistic about things loosening up a tad come Spring 2017, but it will take time for the market to rebalance and regain its footing. Although this recovery has sent sales and prices more or less back to peak levels, the hunt for equilibrium continues.